This week, local newspaper Business Daily carried reports that taxi drivers in Kenya were protesting the disruption of their business by taxi hailing service Uber. The complaints in Nairobi mirrored similar protests in many countries around the world including Brazil, South Africa and the United Kingdom. Most taxi drivers complain over the UberPoP service (referred to as UberX in Kenya), that allows anyone with a car to become a cab driver. The situation in France has however escalated. In 2015, the contretemps between Uber and Taxi drivers drew in the French government which sided with taxi drivers and ordered a national clampdown on the UberPop service, which Taxi drivers feel is bringing unfair competition. The protests are now back with drivers protesting what they see as unfair competition as well as the French government’s inability to enforce laws designed to protect the taxi industry. Uber has about 1 million users in France and has been keen on expanding the service to most Cities in France which, has sparked the backlash. The cab drivers have blocked roads and access to airports and train stations leading to transport chaos. Last year, Uber managers in France were arrested and taken to custody for questioning over illegal activity. A law from October 2014 placed a ban on putting clients in touch with unregistered drivers. 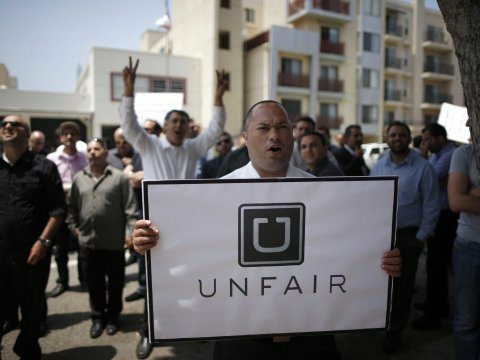 According to France24, Uber has today been fined $1.2 Million over the same. Disruption is painful is it not?